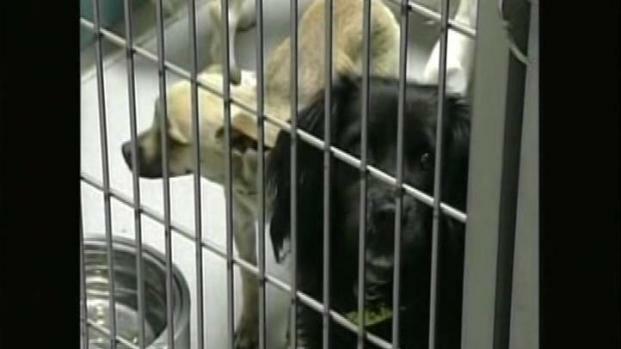 The Glendale city council is considering a ban on dog and cat sales in pet stores and from backyard pet breeders. Animal rights activists say an investigation into deplorable conditions of a puppy mill in the Midwest that allegedly supplied dogs to several Glendale pet stores, helped convince the Glendale city council to consider banning the sale of dogs and cats from pet stores in the city. "Animals that were injured," said Carole Davis, of the Companion Animal Protection Society, speaking about the conditions in the puppy mill in the midwest. "Animals that were covered in feces and urine. Animals that had hair that was matted so much that the eyes were closed off, and that they couldn't see." The proposed ban comes on the heels of West Hollywood's city council adopting a similar policy last year. Los Angeles is also considering a ban. At Pets R Us in Glendale, the manager says they still sell rescued cats, but they stopped selling dogs a few months ago after the C.A.P.S. investigation revealed their supplier got them from a puppy mill. Like Pets R Us, most Glendale pet stores have already voluntarily stopped selling dogs. The new ordinance would still allow residents to sell kittens and puppies that come from unexpected pregnancies, but the ordinance would also prohibit so-called backyard breeders. The city council voiced support for the prohibition after roughly 30 people crowded City Hall in support of the ordinance.